It’s amazing how, despite the stiff competition from mall-based restos and cafes, there thrive those shops that still draw foodies’ attention. Even in Bulacan, plenty of food establishments have started to mushroom like the gastronomic scene in key cities of Metro Manila. Take for example this cafe called ASV Cupcakery. Past the corner where the imposing SM Marilao is located, is a quiet little nook so unassuming that you might miss it if you’re not looking. But don’t be fooled; it has already received a following from the locals as well as those city dwellers who want to stray a bit from their usual foodie circuit. As the name implies, the shop’s specialty is making delectable cupcakes that are easily comparable to those in posh cafes here and abroad. Yet the menu is not limited to these sweet-tooth grubs. In fact, it also offers cakes, sandwiches, waffles, pizza, pasta, and a variety of hot and cold beverages. An ultimate foodie haven, right? 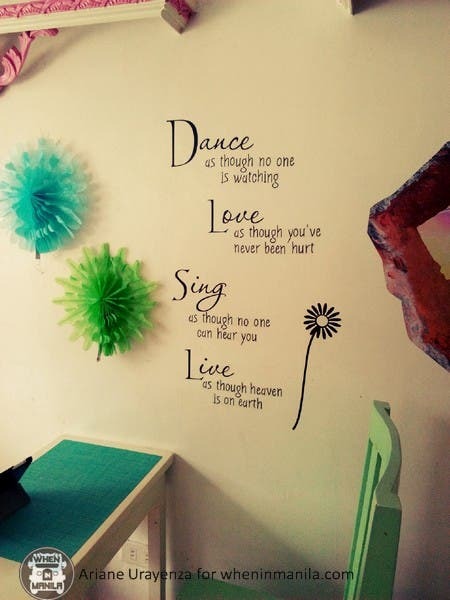 The cafe has an artsy feel about it, with walls painted in white and decorated with interesting decals and quotes. There are old-fashioned lamps and star-shaped balloons hanging from the ceiling, as well as uncoordinated chairs that lend a whimsy and unique appeal. Perhaps its only disadvantage is that it really is small to hold plenty of customers in a day. Still, by extending the operating hours to up to 10:00 PM, it can easily accommodate its clientele who come by for a nice chitchat over coffee or tea. As a matter of fact, it is popular among the student crowd as it is situated strategically in front of a high school and beside Villa Roma, an exclusive subdivision in Marilao. The KitKat Cupcake, one of the bestsellers, is a moist cake topped with chocolate-flavored whipped cream, two KitKat fingers, and a drizzle of chocolate syrup. If you order desserts, pasta, or a grilled sandwich, make sure to wash it all down with a frappe of your own choosing. The frappes that can be bought for dine-in are contained in craft mugs, which makes for an Instagram-worthy photo op. Aside from these cold beverages, you can still opt for a hot cup of coffee, juice, or tea to go with your meal. There is also the café’s own version of “cookie shot,” an edible glass-shaped cookie which can be filled with milk (included in the order) for a satisfying snack (subject to availability). This frappe concoction, the Cookie Butter Frappe (Php 155), will surely give famous coffee brands a run for their money. It is filled to the brim and oozes with whipped cream and an overflowing chocolate sauce. As if it wasn’t enough, it also comes with chocolate chip cookies and butter crumbs on top. Pictured above, on the other hand, is the Sneaky Minaj (Php 155). A caramel frappe loaded with lots of caramel and chocolate sauce, topped with Snickers, choco sticks, and crushed cashew nuts. Oreo Yow! (Php 155) is a cookies and cream frappe topped with whipped cream, Oreo cookies, crushed Oreos, and drizzled with chocolate syrup. In case you find yourself craving for sweets, a visit to ASV Cupcakery is worth driving the distance. From SM Marilao via McArthur Highway, stop by the corner of Lias Road. There’s a tricycle terminal where you can ride a tricycle to take you to the shop and it is ten-minute away. ASV Cupcakery also accepts made-to-order cakes and offers party packages. The shop has also given famous celebrities cakes for their birthdays according to its Facebook official page. That’s how good and top-of-the-line their cakes are.